Stanley Maigarie of Narragansett with a 47 pound striped bass he caught on a fluke jig and teaser under feeding bluefish on his way back from Block Island Tuesday. Mike Clini (right) with a 9.6 pound summer flounder and Matt Davidson with a 6 pounder, both caught in the Block Island wind farm area aboard ‘Skipjack’ captained by Rich Hittinger of Warwick. Black sea bass (BSB) bite is on. The season opened May 25th and fish are being caught with anglers limiting out when fluke fishing. Last Monday night at a public workshop RI DEM took comments on their recommendation to reduce catch limits to meet Atlantic States Marine Fishers Commission (ASMFC) harvest limits. Pending final ASMFC approval (which seems imminent) recreational anglers will be allowed to take just five fish and not seven in the months of November and December. So the season catch limits for BSB (minimum size is 15”) are as follows: May 24 to August 31, 2017- three fish/person/day; September 1 to September 21, 2017 – seven fish/person/day; September 22 to October 21`- closed (when the Federal BSB season is closed); October 22 – October 31 – seven fish/person/day; and November 1 to December 31, five fish/person/day. The scup bite at Colt State Park in Bristol has been good with anglers catching them at the mouth of the Sakonnet River from shore as well and just about on any structure where water is moving. Sea robins are being caught in the Bay and along the shore. Anglers are now keeping them, cleaning the tails and eating them. They are a great eating fish. The Department of Commerce announced last week that an agreement between the National Oceanic and Atmospheric Administration (NOAA), members of the U.S. House of Representatives and the five Gulf Coast states to extend the 2017 recreational red snapper season by 39 weekend days in the Gulf of Mexico for private recreational anglers. The action was lauded by some in the recreational fishing community and criticized by others. NOAA had reduced fishing days to rebuild the stock. The red snapper fishery is rebuilding, however, scientists and conservationists felt it premature to liberalize regulations at this time as they estimate red snapper overfishing could occur in one year and damage the rebuilding plan for the species. Rep. Raúl Grijalva, the top Democrat on the Natural Resources panel, agreed that the decision will interfere with ongoing efforts to recover the red snapper population. In a press statement Rep. Grijalva said "Gulf Coast businesses literally cannot afford a fishery management fiat that eliminates all the progress that has been made… The public needs to see a scientific justification for this plan before it goes into effect." Grijalva pointed to the Magnuson-Stevens Fishery Conservation and Management Act, noting the law is intended to ensure the use of scientific data for fisheries decisions. He noted that the Federal Register announcement of the extension suggested the amended fishing season "may delay the ultimate rebuilding of the stock by as many as six years." A fly tying workshop will be held on Wednesday, June 21, 6:30 p.m. at the North Kingstown Free Library, 100 Boone Street, North Kingston. John Smith, a lifetime angler, avid fly tyer and biology professor at East Stroudsburg University will tie a few different styles of flies and introduce participants to basic fly tying equipment. Registration is requested but not required. Call 401.294.3306. ‘Warming Seas and the Ocean State’ is the topic that will be discussed Thursday, June 22, 7:00 p.m. to 8:00 p.m. at the Coastal Institute Auditorium, 220 South Ferry Road, Narragansett. The discussion will be led by students of the University of Rhode Island Graduate School of Oceanography. The seminar will cover how physical processes are responding to warming sea surface temperatures. The later portion of the program will focus on the effects of warming on coastal ecosystems, illustrating how fish species are being impacted by climate change and what it means for Rhode Island fisheries. For information contact gsobayinformed@gmail.com . 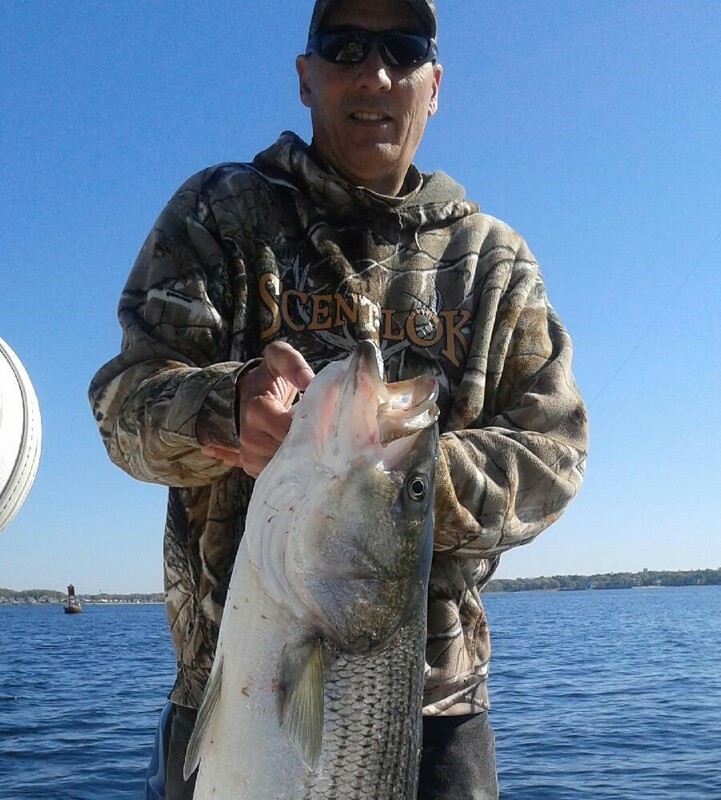 Mike Swain with one of the many striped bass he has caught in the Conimicut Light area using live and chunks of Atlantic menhaden (pogies). 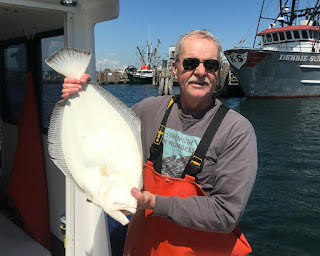 Rich Hittinger of Warwick with a 7.8 pound summer flounder (fluke) he caught off Block Island last Thursday when fishing on his vessel ‘Skipjack’. You’ve tried to catch a keeper sized striped bass (28” or larger), but just have not hooked up with one yet. It can be very frustrating because you can try and try with no luck. However, June is the time to try to catch one in Narragansett and Mt Hope Bays as Atlantic menhaden (pogies), a form of herring, are up in our covers and rivers spawning and the striped bass have followed them into the upper Bay on their northern migration. I have two bits of advice that have helped me over the years to catch striped bass. First, you can’t catch fish where there are no fish so you have to put yourself in places where the fish are feeding. And second, you need to be ready with a number of strategies. Some days they are biting on live or chunks of Atlantic menhaden, other days trolling umbrella rigs or tube and work, and yet some times of year they like eels. To put yourself where the fish are read fishing reports/blogs and talk to friends and bait & tackle shop owners to develop a fishing plan. Select five or six places you will go to find the fish based on the research you have done. Now that you have your fishing plan, be ready with a number of fishing strategies to land that striped bass. Remember what works one day, may not work the next depending on what fish are feeding on, the weather, tides, temperature, etc. Here are some of my favorite striped bass fishing strategies. Trolling with umbrella rigs. Like to use this technique trolling in deeper parts of Narragansett Bay, off Newport or Block Island with a variety of squid, shad, worm or eel umbrella rigs. Hook two fish at the same time and you will experience a great fight. Live menhaden. Snag the live bait with a weighted treble hook or net them. Hook the bait through the bridge of the nose, find a school of fish and put the live menhaden into the school of bait and let it swim. Used when menhaden are running strong, particularly up the Providence River in early spring. Chunking fresh or frozen menhaden. You can anchor (and chum); drift fish or fish the moving bait schools with chunks. Some anglers use a weighted slide to get the bait down to the striped bass. Surface plugs, swimming lures and soft plastics. Have caught hundreds of school bass in the spring using surface plugs and swimming lures of all types. Great way to catch fish in coves, on rivers, etc. My favorite is a grey Yozuri Crystal Minnow. Many anglers love soft plastics use them successfully in the spring. Make sure the plastic baits are scented if they are not add some menhaden scent. Who wants to eat plastic? Trolling with tube and worm. I have had great success in the Bay using lead line weighted with two or three ounces of lead between the line and a five foot monofilament leader. I find that bubblegum or red colored tubes work best in spring (the tube hook is tipped with clam worm). The idea of added weight is to get the line down to where the fish are. Tube and worm trolling has been a successful technique for the Southwest side of Block Island using 300 ft. of wire line out in 35 to 45 feet of water, amber colored tubes seem to work best there. Buck tail jigs with pork rind strips. Have had success with this method to get under schools of blue fish and to the striped bass on the bottom. Let me know if you catch that keeper and send along a photo to dmontifish@verizon.net. The Department of Environmental Management (DEM) will hold three day fly fishing workshops on Monday, June 12, 19 and 26, 6:00 p.m. to 8:00 p.m. at the Coventry Public Library, 1672 Flat River Road, Coventry and on Wednesday, June 14, 21 and 28, 6:00 p.m. to 8:00 p.m. at the Greenville Public Library, 573 Putnam Pike, Greenville. Instruction and equipment needed will be covered with all gear provided. However, participants are welcome to bring their own gear. Adults and children 10 and older are invited to attend. Space is limited. To register contact Scott Travers at scott.travers@dem.gov. (Classes also stared at Glocester Manton Public Library on June 6). DEM is also holding an introduction to freshwater fly fishing workshop on Saturday, June 17 from 9:00 a.m. to 3:00 p.m. at Addieville East Farm, Mapleville, RI. Adults, families and children ten and older may attend. Participants will learn about equipment needed for the sport, fly-tying and casting and best areas to fish in RI. Lunch will be provided. Fee is $15 per person. To register contact Kimberly Sullivan at Kimberly.Sullivan@dem.ri.gov . Scup. “We had a customer catch a 17” scup off the Stone Bridge this week with some nice fish being off of Colt State Park, Bristol.” said Manny Macedo of Lucky Bait. “The big news of the week is that scup are in… anglers are catching them off Tiverton and Greenwich Bay.” said Henault of Ocean State. Sea robins. More anglers are keeping them to eat. Cut of their tails and fillet them. They have a delicious white meet. In Europe sea robins are a major ingredient in bouillabaisse. I have cleaned them for many charter customers and all have said they loved the way they tasted. Black sea bass bite is on. 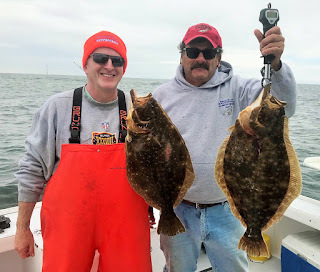 The season opened May 25th and fish are being caught with anglers limiting out when fluke fishing. Freshwater fishing continues to remain strong. “Not many anglers are targeting trout but those that are continue to catch them. And, we have a lot of anglers catching good numbers of largemouth bass. They may not be as large as last year but the bite is stronger.” said Henault. 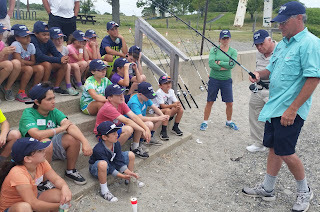 Richard Reich, lead surfcasting instructor, explains some of the fundamentals of casting to youth fishing camp participants on Rocky Point Beach, Warwick, RI. Fishing appeals to our sense of adventure and builds a life time of memories with family and friends. The three day camp, sponsored by the Rhode Island Saltwater Anglers Association (RISAA) and the Rhode Island Department of Environmental Management (DEM), will host 50 children from seven to fourteen years old. There is limited camp space available, sign up this week by calling the RI Saltwater Anglers Association office at 401.826.2121. The Rhode Island Department of Environmental Management (DEM) will host a fly fishing school on Saturday, June 17, 9:00 a.m. to 3:00 p.m. at Addieville East Farm. Learn the basics of entomology, fly tying, fly casting, the right equipment to use, knot tying and then fly fishing in a freshly stocked trout pond. Minimum age is eleven years old. Cost of $15.00 will cover your lunch with the fly fishing program free. All fly fishing equipment will be supplied but feel free to take your own. To register contact Kimberly Sullivan, DEM at kimberly.sullivan@dem.ri.gov or 401-539-0037; or Scott Travers, DEM at scott.travers@dem.ri.gov or 401-539-0016. 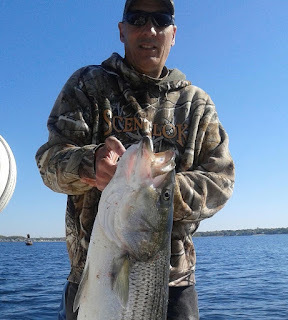 Striped bass fishing is good in the Bay with most action in the East Passage from Bristol all the way up to the Hurricane Barrier in Providence. “There are a lot of school bass being caught with some keepers mixed in this week. Customer Albert Bettencourt with his son and grandchildren caught over 60 small school bass using jigs and small spoons last Thursday night.” said John Littlefield of Archie’s Bait. Holly Frye of The Tackle Box said, “One customer weighted in striped bass to 13 pounds this week fishing with lures at Conimicut Point from shore.” “The southwest ledge and north rip at Block Island are yielding small but keeper size striped bass in the 10 and 15 pound range. Anglers are trolling umbrella rigs with multiple fish hooking up at the same time. School bass with some keepers mixed in are being caught from the beaches as well as Pt. Judith Pond, Ninigret and other ponds along the southern coastal shore.” said Elisa Cahill of Snug Harbor Marina. Ken Ferrara of Ray’s Bait & Tackle said, “Bass are being caught in multiple locations in the East Passage from Popasquash Point, Bristol to the Providence River Hurricane Barrier area. Anglers are using Atlantic menhaden with success, some are drifting with live pogies and overs are anchoring up and chumming with chunks. 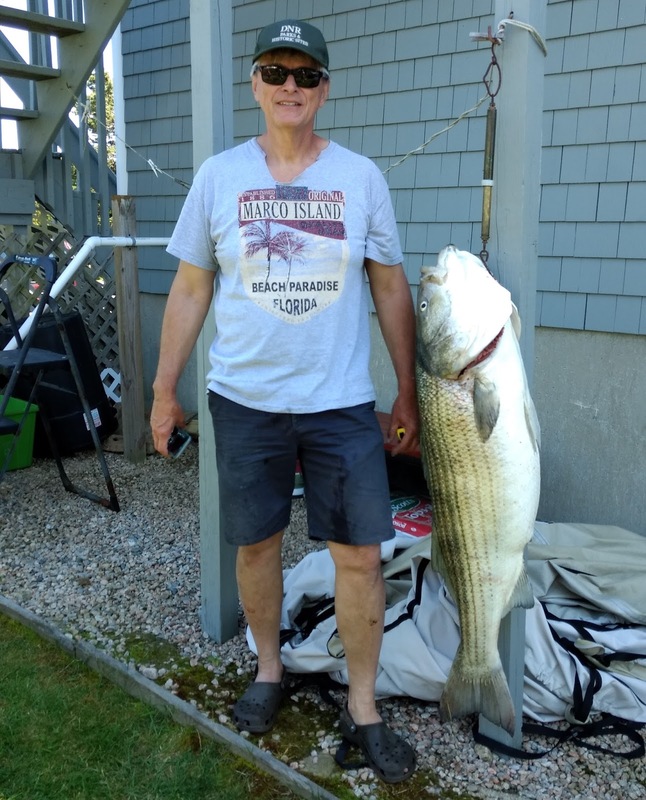 Ohio Ledge and Napatree Point have been good..” “We weighed in a 41 pound fish caught in the East Passage by Rocky Patriarca off Prudence Island but we also weighed in 27 and 31 pound fish caught in the Conimicut Light area this weekend.” said John Littlefield. 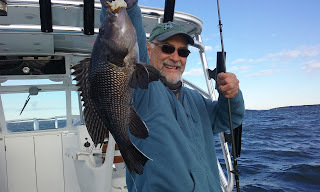 Kevin Fetzer with a black sea bass caught last year. The season opened Thursday, May 25th with a three fish/person/day limit, however, regulations are expected to change. 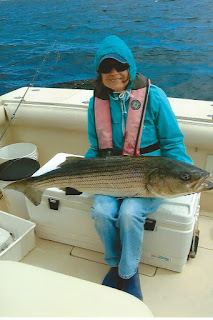 Bonnie Audino’s 31.5 pound Taunton River striped bass caught when trolling a T-man tube & worm with her husband Larry. As required on 34” or larger recreational fish the right pectoral fin has been cut. Climate change and warming water is impacting the location and numbers of important fish species on the east coast. A study published in Progress in Oceanography titled “Marine species distribution shifts on the U.S. Northeast Continental Shelf under continued ocean warming”, shows that some fish species are gaining more natural habitat in northern regions and others are losing suitable habitat. Those gaining habitat include spiny dogfish, summer flounder, black sea bass, and lobsters. Yet we are losing suitable habitat for such species as American cod, haddock, thorny skate and Acadian redfish because the water is too warm and the fish are moving to deeper water. The projections indicate that as species shift from one management jurisdiction to another, or span state and federal jurisdictions, there will be an increased need for collaboration among management groups to set quotas and establish allocations. “Species that are currently found in the Mid-Atlantic Bight and on Georges Bank may have enough suitable habitat in the future because they can shift northward as temperatures increase,” said lead author Kristin Kleisner, formerly of the Northeast Fisheries Science Center (NEFSC)‘s Ecosystems Dynamics and Assessment Branch and now a senior scientist at the Environmental Defense Fund. “Species concentrated in the Gulf of Maine, where species have shifted to deeper water rather than northward, may be more likely to experience a significant decline in suitable habitat and move out of the region altogether. Given the historical changes observed on the Northeast Shelf over the past five decades and confidence in the projection of continued ocean warming in the region, it is likely there will be major changes within this ecosystem.” said Kleisner. It is important to note that sea surface temperatures in the Gulf of Maine have warmed faster than 99 percent of the global ocean over the past decade. Northward shifts of many species has already occurred from one management jurisdiction to another. These changes will directly affect fishing communities, as species now landed at those ports move out of range, and new species move in. A copy of the article can be found at www.sciencedirect.com . NOAA Fisheries announced revised 2017 and projected 2018 catch limits for black sea bass taking effect May 25, 2017 for both recreational and commercial fisheries. The revisions were instituted because of the recent benchmark stock assessment completed in December, 2016. Based on the new stock assessment information, NOAA is implementing revisions to the 2017 black sea bass specifications that represent a 53-percent increase in the 2017 commercial quota, and a 52-percent increase in the 2017 recreational harvest limit. Additionally, NOAA is removing an accountability measure that was applied to the 2017 commercial fishery at the beginning of the fishing year to account for a previous overage in 2015. At press time Rhode Island commercial quotas and recreation fishing harvest limits had not been revised. The Narragansett Chapter of Trout Unlimited (TU225) will hold its monthly meeting and seminar on Wednesday, May 31, 6:00 p.m. at the Arcadia Management Area Check Station, Rt. 165, (Ten Rod Road), Wood River, Exeter, RI. Members and guests are invited to come at 5:00 p.m. for hot dogs, hamburgers, salads, chips, and soda/water. Park Regulations for the Arcadia Management Area do NOT permit consumption of alcohol. At 6:00 p.m. a short meeting will be followed by a spey casting demonstration by Vinny Diodato. Those wishing to participate are invited to bring their own equipment. A limited supply of loaner gear will be available. Contact Glenn Place at 1-401-225-7712 or TU225President@gmail.com for information. Squid fishing. Capt. Frank Blount, owner of the Frances Fleet, reported some improved squid fishing this past Friday Night with a really nice shot of good size tubes later in the evening and a few anglers filling upwards to a half of a four or five gallon pail apiece. Scup and black sea bass. “The scup bite is just starting to heat up with customers catch nice sized fish at Colt State Park.” Said Manny Macedo. 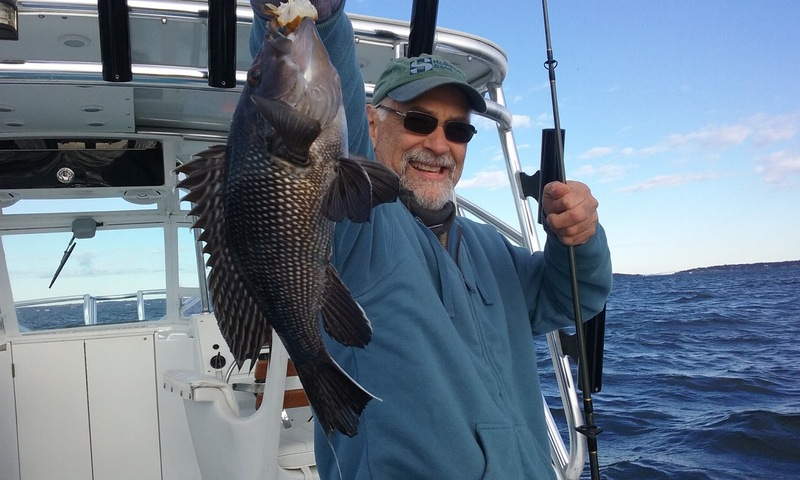 The black sea bass bite has been slow put is expected to get better this week as the water warms with a season start date of May 25 with a three fish/person/day limit. 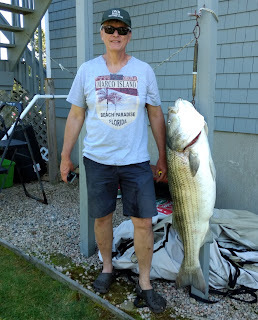 How big is fishing in RI? Large school bass like this 26” fish are being caught in coves, rivers and salt ponds like this one land by Kevin Fetzer of East Greenwich when fishing in Wickford Cove Saturday. Experimental reefs at Quonochontaug Pond aim to improve the growth and survival of recreationally important fish such as black sea bass, tautog, striped bass, scup, summer flounder, and winter flounder. Bass in the Bay… Bob Signorello of Bethlehem, PA with two striped bass he caught of Cast-a-fly Charters last week. The women and men, who catch, process and support commercial fishing do our state and country a great service. They allow us to have fresh, nutritious seafood on our dinner table at a reasonable price. It you do not fish yourself, or have friends and relatives that fish, there is no other way you can acquire this great source of protein. 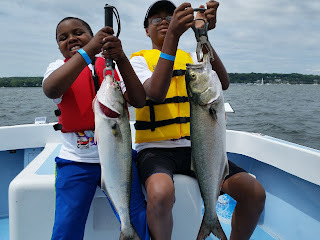 Additionally, commercial fishing has a big economic impact in Rhode Island, with recreational fishing having even a greater economic impact according to the National Oceanographic & Atmospheric Administration (NOAA). Earlier this month NOAA released an economics report (see link below) that said the 2015 economic impact of the Rhode Island commercial seafood industry was approximately $290-million in sales, $105-million in income, $147- million in value added to the economy, and the industry supports 4,522 jobs in Rhode Island. What was surprising is that recreational fishing has even a greater economic impact on the state. The report said that recreational fishing generated $332-million in sales, $141-million in income, $216-million in value added to the economy, and the industry supports 3,554 jobs. A copy of the report titled NOAA’s Fisheries Economics of the U.S. can be found on NOAA’s website at https://www.st.nmfs.noaa.gov/economics/publications/feus/fisheries_economics_2015/index . The report said that nationally commercial and recreational fishing generated $208 billion in sales, contributed $97 billion to the gross domestic product and supported 1.6 million full- and part-time jobs in 2015. The four different measures in the report show how fishermen expenditures affect the economy in a region (state or nationwide): sales, income and value-added, and employment. Sales refer to the gross value of all sales by regional businesses affected by an activity, such as commercial or recreational fishing. It includes both the direct sales of the fish landed or those made by the angler and sales made between businesses and households resulting from that original sale. Income includes personal income (wages and salaries) and proprietors’ income (income from self-employment). Value-added is the contribution made to the gross domestic product in a region. Employment is specified on the basis of full-time and part-time jobs supported directly or indirectly by fish sales or the purchases made by anglers. NOAA Fisheries uses a regional impact modeling software, called IMPLAN, to estimate these four types of impacts. Rhode Island’s black sea bass (BSB) regulations will likely change again becoming a bit more conservative for the later part of the season. Current measures to meet 2017 Recreational Harvest Limits (RHL) for BSB have been revisited by the Atlantic States Marine Fisheries Commission based on the overfishing of harvest limits that occurred in the last two months of 2016 (which is referred to as Wave 6). So this means we can expect a change in what were tentative 2017 Rhode Island BSB regulations, likely in the later part of the season. The tentative split season regulations for BSB were: three fish/person/day from May 25 to August 31; seven fish/person/day between September 1 through September 21; a closed season when federal waters are closed from September 22 to October 21; and seven fish/person/day from October 22 to December 31. The final State of RI ruling will be reported once it is released, likely sometime in June. The RI DEM and the Nature Conservancy have teamed up to develop nine experimental reefs made of recycled surf clam and oyster shell, and then seeding them with live oysters. The idea is that the complex surge will attract marine life, and provide food and shelter for juvenile fish, increasing survival rates. State and Nature Conservancy scientists say the aim of the multiyear project is to find out whether constructing oyster reefs in shallow coastal areas can improve the growth and survival of early life stages of recreationally important fish such as black sea bass, tautog, striped bass, scup, summer flounder, and winter flounder. The Nature Conservancy and RI DEM pooled their resources to fund this project, with support from the U.S. Fish and Wildlife Service’s Sport Fish Restoration Program and many individual donors. Tautog fishing reports are mixed. Some anglers are finding the fish and catching there limit, three fish/person/day and others are not catching many at all. Overall it has been a very slow spring tautog season.